Heineken has lured James Bond away from the martinis and onto the beer, in its new interactive campaign launched around the upcoming Bond film, Skyfall. 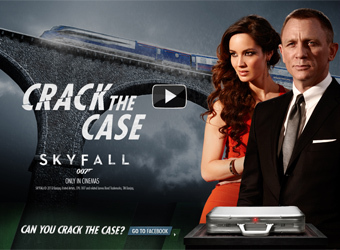 Created by Wieden & Kennedy Amsterdam, ‘Crack the Case’ features a one-minute short film starring Daniel Craig and new bond girl, Berenice Marlohe, and is accompanied by an interactive video where Marlohe invites you to become a secret agent. The spot starts with a pursuit of its main character through a moving train with its carriages decked out in replica sets of past Bond films, and culminates in the character sharing a Heineken with Bond before being handed his briefcase. Viewers are then linked through to the interactive video on Facebook in which Marlohe invites you to crack the code on the briefcase by finding hidden items in the video. The execution asks you to connect to Facebook to personalise the video by using your profile picture as the image of the secret agent being tracked down by the bad guys. Skyfall will launch on Australian screens on 22 November. The 007 campaign integration, which includes Bond images on packaging, is the largest activation in Heineken’s 15-year partnership with the franchise.